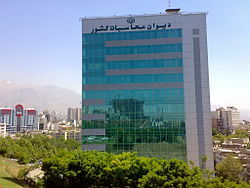 The Supreme Audit Court of Iran (SAC) (Persian: دیوان محاسبات کشور) is a government agency of the Islamic Republic of Iran. Located in Tehran, it is supervised by the Iranian Parliament and dates back to 1906. Articles 54 and 55 of the Constitution of the Islamic Republic of Iran define the objectives and responsibilities of SAC, the most important duty of the organization being the preparation of the government's Budget Liquidation Report, as specified by article 55 of the Constitution. "$1 billion missing oil money"
In May 2009, SAC reported that 1 billion was missing from Oil Stabilization Fund. Iranian President Mahmoud Ahmadinejad says the issue of the 'missing' $1 billion from the country's currency reserve fund is in fact an "accounting error." However, the claim prompted a firm response from SAC which rejected any talks of "accounting errors" and rebuked the government for providing "insufficient answers" in the case of the missing $1.058 billion oil money. SAC defended both methodology and accuracy of its work and revealed that there had been 1463 cases of infractions regarding the country's 2007-2008 budget. According to SAC's report, illegal payments to some government officials accounted for a large part of the infractions while there were also cases in which the government had acted against the articles of the budget law. Asked whether Transparency International's recent report on administrative corruption in Iran corresponds to the findings of the Supreme Audit Court, SAC Director Fazli said the report is based on criteria that the SAC does not recognize. "This does not mean that Iran rejects the report and the country should make efforts to fulfill their criteria," he added. ^ "Ø¯ÛŒÙˆØ§Ù† Ù…ØØ§Ø³Ø¨Ø§Øª Ú©Ø´ÙˆØ±" (PDF). Dmk.ir. Retrieved 2013-08-01. ^ a b c d "No Operation". Presstv.com. Retrieved 2013-08-01. ^ "No Operation". Presstv.com. Retrieved 2013-08-01. ^ a b "Iran: Oil Revenues Monitored Monthly". Zawya. 2009-12-10. Retrieved 2013-08-01. ^ Stephen Fairbanks. "Iran". Freedom House. Retrieved 2013-08-01. This page was last edited on 8 June 2017, at 05:27 (UTC).